Photo received from Brian Turner (UK). 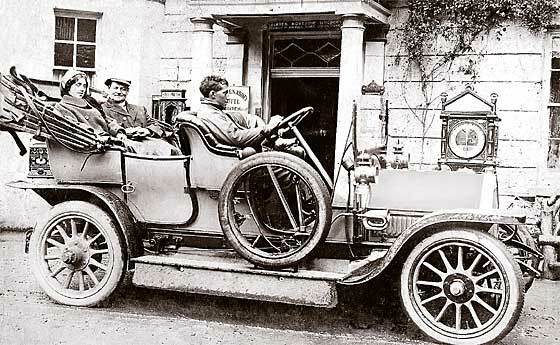 His enquiry was: "Any idea what make of car this is? I assume it's pre-1904 as there's no visible registration. Many thanks." As we have not received a reply to our follow-up email, we know no more about the photo. 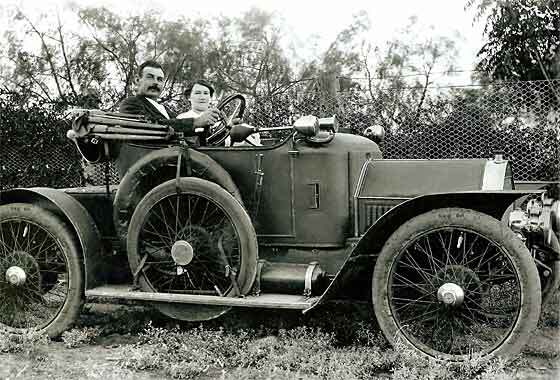 Identified by our Tim Harding, the car is a cca 1902 Panhard - Levassor, probaby a 16HP. One of the clues is the offset starting handle. Lytham Hall is in Lancashire, originally a small Priory mentioned in the Doomsday Book. 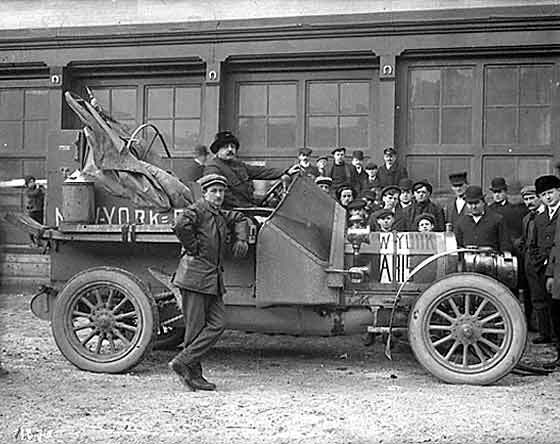 Photo received from Barry Patchett (UK) who is restoring a car which he believes is the Zust which finished third in the Great Race of 1908 from New York to Paris. The car was brought to England for display. In Bromley, on way to Folkestone, a fire broke out killing a mechanic. He needs to know: Where was the car displayed? Was there a dealer in London? Where did the car go after the fire? Was it shipped from a particular port ? Any shipping records which identify a chassis number ? Another Photo received from Gillian Long (UK) taken outside Rushen Abbey Hotel on the Isle of Man, but she does not know exactly when. 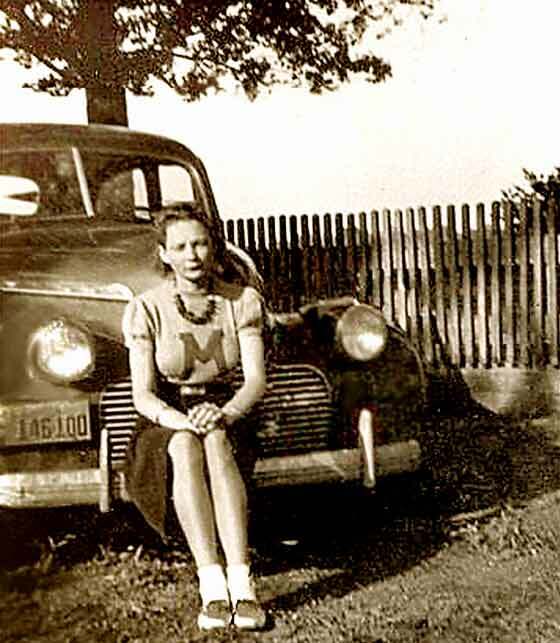 She believes the woman seated in the back of the vehicle is her great grandmother [1880-1928]. 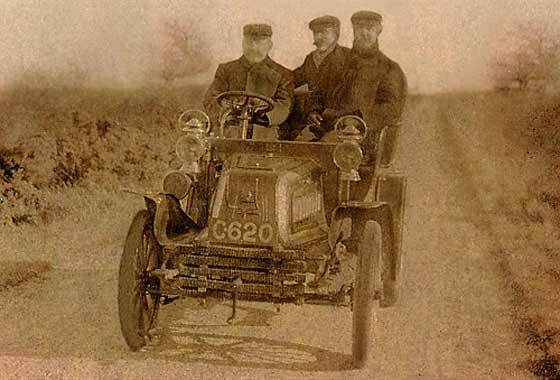 We can advise that the car is cca 1907 'Beeston' Humber. These are distinguishable by the big rounded scuttle visible behind the screen. Beeston Humbers are so called because they were made in the Beeston factory, considered better, than Coventry. Photo received from Ray Preston from the Isle of Wight (UK) who is doing family research. Photo of a family group taken in New Zealand in 1915. The lady in the front is my Great Aunt, her husband, and two of their sons. The note on the back of the photo said; 'Dad (Charles), and I and the boys at camp where Cecil is in Training for Samoa.' We can advise that the car is an Austin. 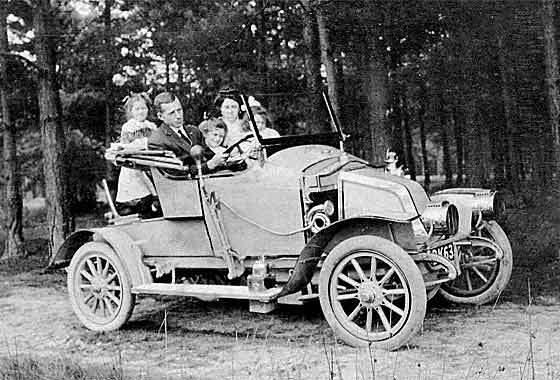 Original thoughts were a 10/12 or 12/14 Tourer, but John Caddy and Co think it a cca 1912 Austin 18/24. Photo received from Nigel Kennard (UK) showing his maternal grandparents, mother and her sisters. The girls were born in 1904, 1905 (mother) and 1908, if that helps. Grandfather was an ammunition manufacturer’s traveller for Kynoch in Birmingham. Original thoughts due rad top and dumbirons, it could be a Charron, but our Tim Harding advised this is a cca 1912 Renault AX 8HP. Registration unclear; DK 63 would be Rochdale late 1905, and BK Portsmouth. Dates are confusing! Photo received from Gillian Long (UK). Nothing much is known about the photo. We had identified this as a Bedilia 'special' in view of the bonnet but Graeme Jarrett contacted us from Australia to say: " Please refer to attached advert from the 'Cyclecar' magazine November 1912. If you study the detail of the body and mudguards you will see it is in fact a Rollo Tandem circa 1912/13." He is right! Rollos were made in Birmingham between 1911-13. A sample of Bédélia is on Help Page 3. Photos received from Jim Ehlers of Lake City, Florida (USA). We don't know much about the pictures, other than : Wife's Grandparents---early 1900's--Globe, Arizona--Autos: Sending these along to you, and wondering what the car is?? Lots of cars of the period had very similar radiators so it can be very difficult to tell but our Tim Harding identifies this as a 1913 Cadillac Model 30 4 cylinder Tourer. This was the only model made for a number of years. Picture of another on Help Page 10. Photo received from Phyllis Elliott who has not subsequently responded so we have no idea where she is calling from or any story on the car. 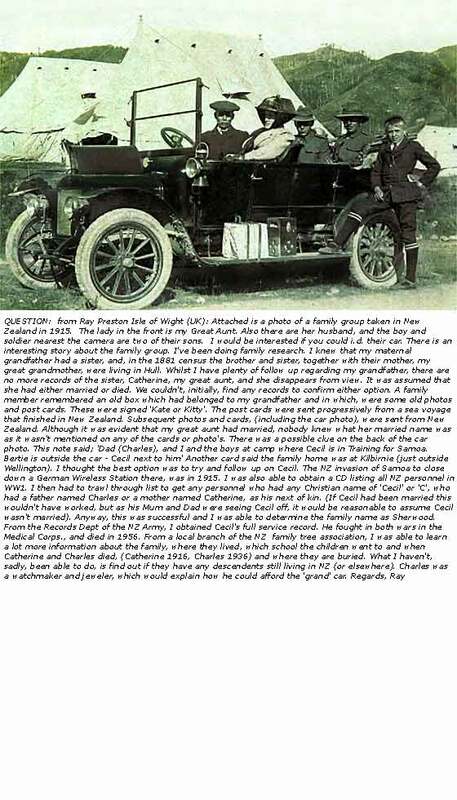 She advised that the photo is of her husband's grandparents taken in about 1915 but after lots of research no one has been able to identify car. Someone had apparently suggested it could be French because of the hubcaps but that is all she can get. ANY help would be appreciated! 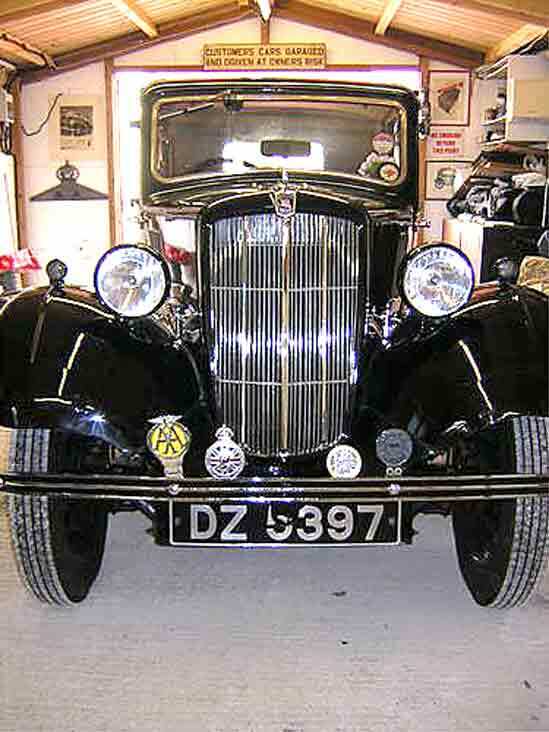 We can advise the car is British, and is a cca 1913 Humber Two Seater. Photo received from Neil Anderson (UK). He is another enquirer that did not put SVVS-MAIL in the 'subject' line and was likely to be auto-deleted with the thousands of SPAM emails we get. His enquiry was: "My auntie died recently and my father was given this photograph. It is my Grandparents, and my father is the little boy in the cap at the back! 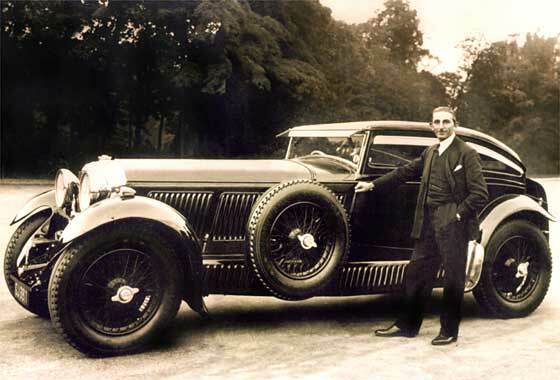 He is 87 now so I imagine this is in the late 1920's and he is sure the car was a Rover. " 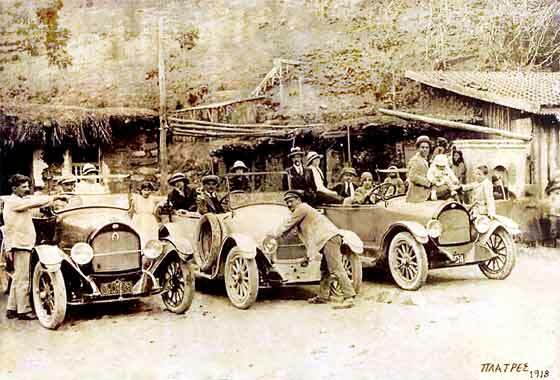 Pa's memory is good, because it is a cca 1913 Rover 12. Photo received from Andy Bolam from Platres (Cyprus). His enquiry was another that did not have SVVS-MAIL in the 'subject' line and likely to be auto-deleted with the thousands of SPAM emails. Andy advises he emigrated to Cyprus 4 years ago from England and now lives in Platres where the photo was taken in 1918. He was given this photo as he has a passion for vintage cars. ..'Congratulations on an excellent web site..' Thanks. 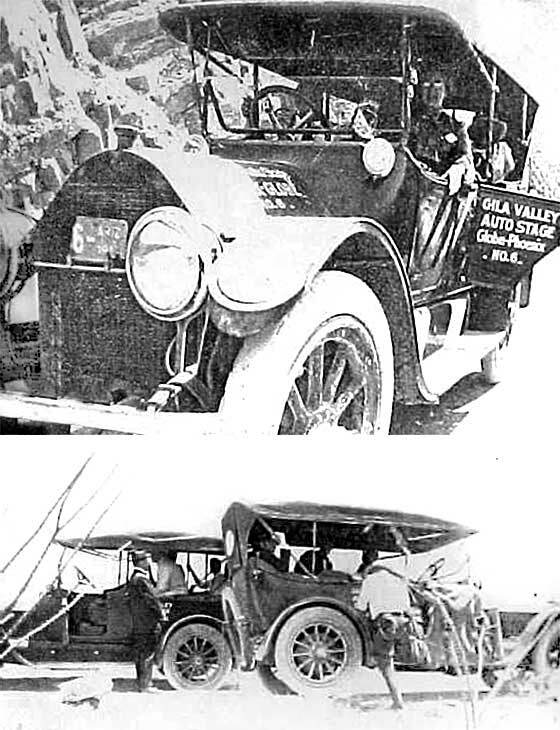 The cars, all three, seem to be cca 1917 Willys Overland 84 - 4. Photo received from Peter Taylor, Wellington (New Zealand) who is preparing a web site for St George’s House, the Police Orphanage which used to be in Harrogate, Yorkshire UK. 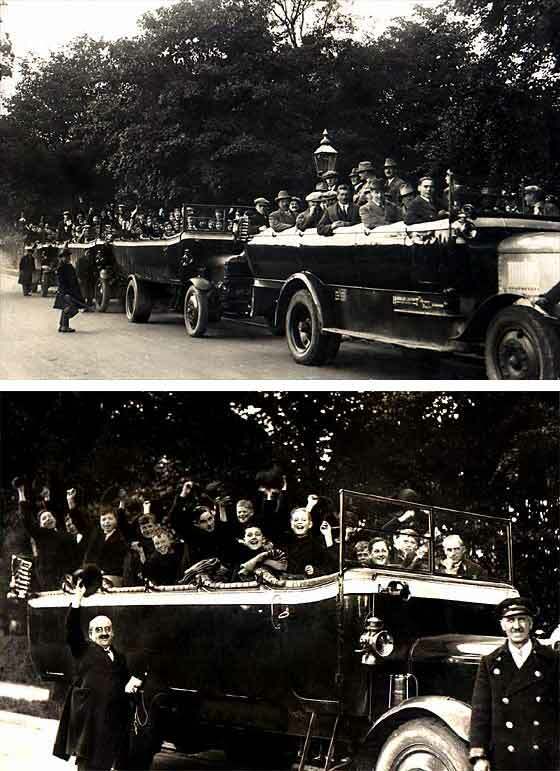 He wanted to include the two photos which show the orphans going on an outing. Our Tim Harding identified the second charabanc, also shown in closeup photo as a cca 1920 Daimler Model CC. All the charabancs behind it also appear to be Daimlers but we are not quite sure of the make of the front Charabanc. 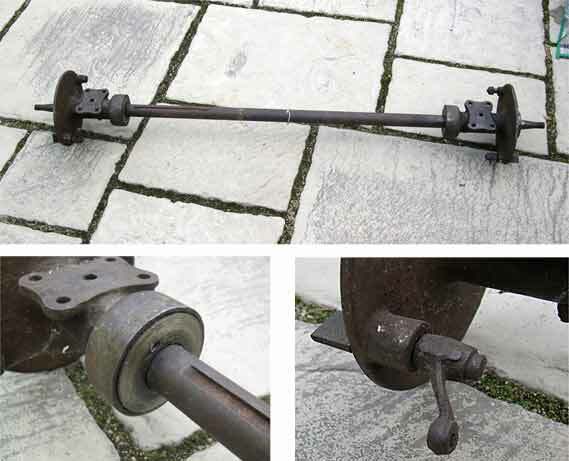 Photo received from Adrian Tyler (UK) who bought this axle for his vintage 'Special' hill climb car that is based along cyclecar lines with V twin engine and motorcycle gearbox. 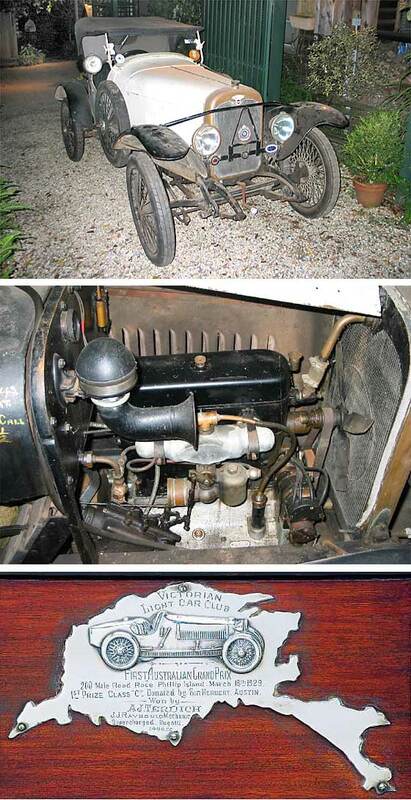 He was told that it is from a c1920 Richardson Cyclecar, but can find no reference the car existing. We can advise Richardsons were made in Sheffield based on a JAP V twin engines with friction transmission and belt, later chain drive. It seems some 500 Richardson Cyclecars were made before closure in 1921. Another Photo received from Averil Thornton (UK) the editor of a nostalgic Yorkshire magazine 'Down Your Way' in which readers write about the past. We don't know anything about the photo. The picture was very fuzzy and needed repair. The photo was eventually identified by our Tim Harding as being of a cca 1924 Hillman 11 Hp Two Seater Tourer. This was a development of AJ Dawson design of the Hillman 'Peace Car' of 1917, before Dawson went on to have his own company. Photos received from Chris Terdich (Australia) of his 1924 Wanderer type W8 Race Car. He is trying to find out if any other W8 have survived anywhere in the world? 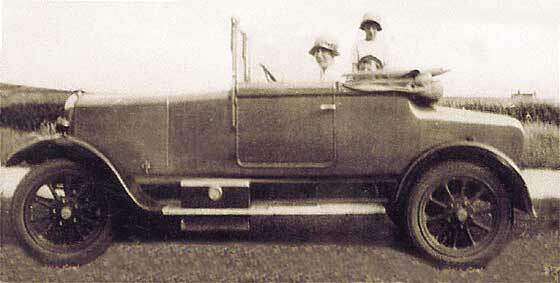 The car was imported to Australia in 1924 as new by the importer Wagner and has only had 2 owners since. Chris is only the 2nd owner. The car was entered in the 1928 Australian GP, and his Grandfather subsequently won the 1929 Australian GP at Phillip Island in this car. Chris has a lots of info on these cars racing in the 20s. Photo received from Cliff Thornton, Wickford, (UK) who is researching the works of the famous Lake District photographer G.P. 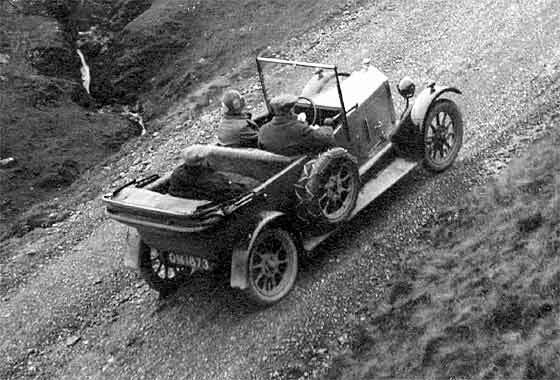 Abraham, - who took this photo of a car climbing a steep unmetalled road known as Buttermere Hause. 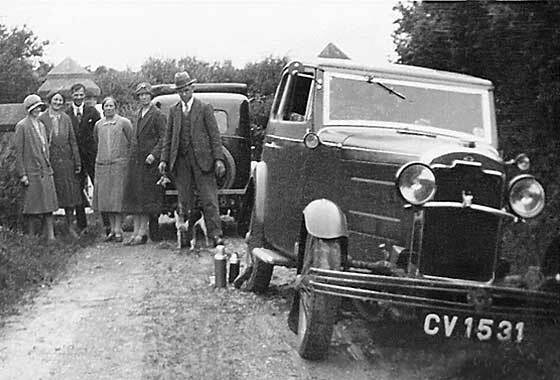 We believe the car is a cca 1925 Wolseley 11/22 Tourer. Registration OM 1872 is a Birmingham CBC issue of early 1925. Interesting to note the chains fitted to both spare wheels. Buttermere Hause, village, valley and lake were never conquered by the Normans. 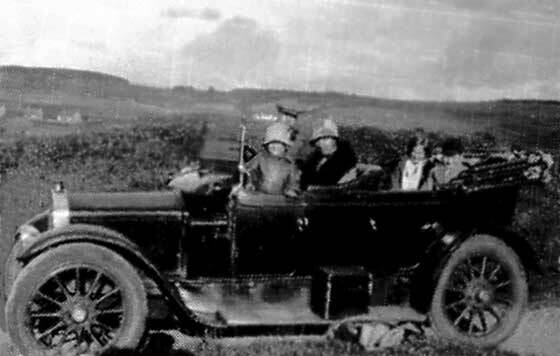 Photo received from Keith Richards (UK) which is a family snapshot of an outing probably somewhere in Cornwall. Photo includes his Parents and his Uncles and Aunts. He has tried to trace the car registration details but these appear to have been destroyed! We can advise that CV 1531 was issued by Cornwall County Council, in the first quarter of 1930, which helps in dating the car. The car is a very lovely Rover and full identification is that it is a 1930 Rover Light Six Sportsman Saloon. 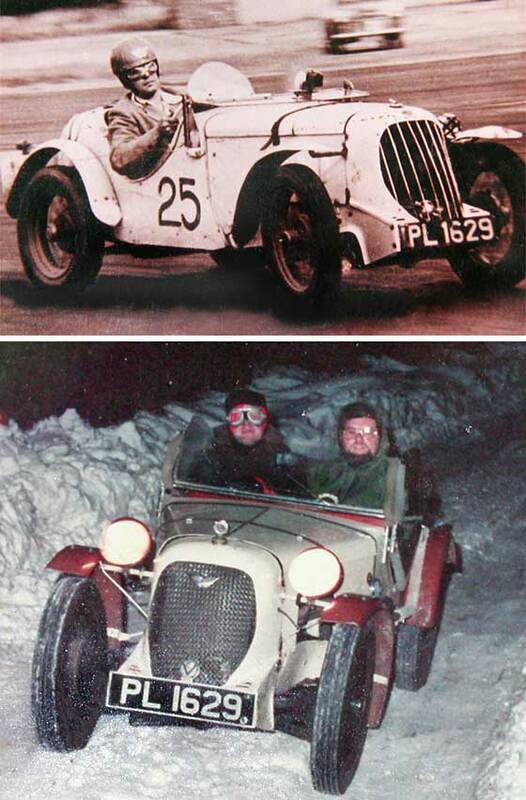 Photos received from Andrew Wilson, Hereford (UK) who is looking into the early history of his 1930 Austin Ulster, first owner Mr. Ashwood–Letts of Postern Court, Holwood Surrey, then Mr. Barrington, Surrey, then Esher Garage, Surrey? The A7 has a Brooklands type cowl covering a blower taken off for 750 racing (see photo by a Mr. Valinder, Gloucester). Our expert notes it was recorded in the A7CA Register as a 1930 Special colour Cream & Brown chassis owned by a 750MC member. The other photo received from Lee Cooke of Austin, Texas (USA) showing two cars photographed in Alabama in the 1935 to 1948 period. 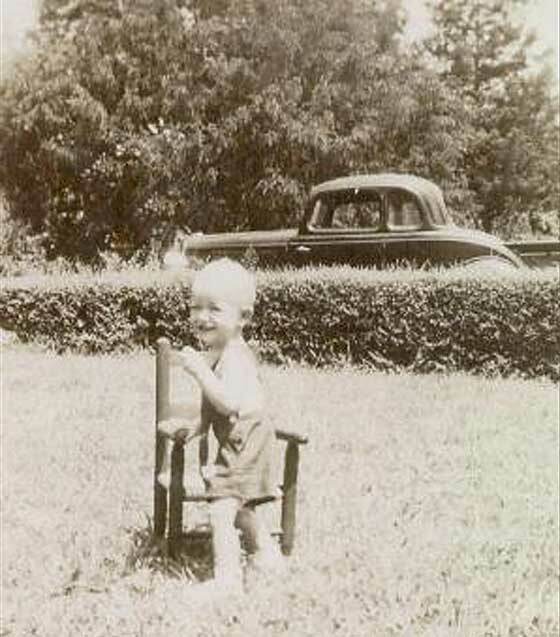 This photo was headed 'Granparents front yard, Marion, Al, circa 1945'. We have no other information on the photographs. Most American car manufacturers made very similar coupes during this period. What makes this one stand out is that the doors open forward (suicide doors) making it a cca 1933/34 Ford Coupe, type known as the 'Five Window'. Photo received from Mrs. G. Lawrence (UK). 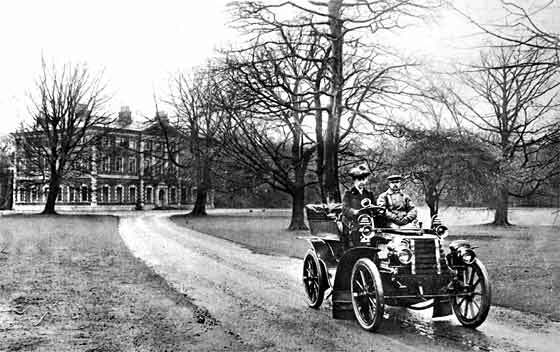 Her husband's father, Mr HF Lawrence by the car, was chauffeur to two women who lived in Sydenham. The photo was taken in about 1946. Her husband would like to know what car it is and details on the number plate. 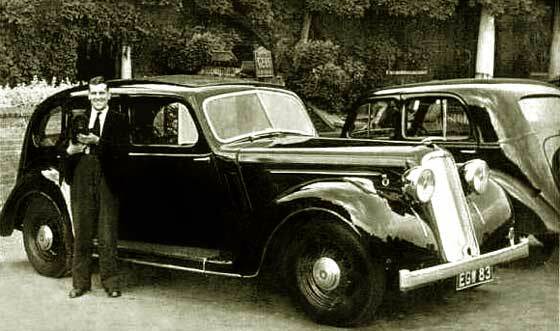 We can advise that the car is a 1937 Humber Snipe and that the car behind looks contemporary, a Vauxhall 10hp. The registration EGW 83 was issued by London County Council sometime between August / September 1937. Photo received from Gemma Whittall (UK) who has not responded to our emails, hence we know nothing about the photo. The car is a Morris 8 and our Chas Moody advises that the Series II Morris Eight was announced in 1937 with radiator shell painted, not chrome as the Series 1, 'inner of vertical slats brightened by three chromium plated strips'. Perhaps later re-chrome? Without other views/distinguishing features, - can't say more. The registration is Antrim (NI) but dating records lost. Photo received from Lee Cooke of Austin, Texas (USA) showing two cars photographed in Alabama in the 1935 to 1948 period. As we have had no reply to our subsequent email, we have no other information on the photographs. The photo was headed 'picture circa 1940 - 41'. Being a British car club we do not have much experience of American cars. The picture is not very clear and there is not much of the car visible to make model identification possible. It is however a cca 1940 Chevrolet. Brief email received from a Brian from an undisclosed country attaching a number of photos of a garage showing a car under a mound of rubble. He wanted to know the make. In view of no further correspondence we can only presume that he is not with the car because much would be revealed by the simple action of removing the toolbox. Fortunately the photo shows a specific giveaway in the form of the sidelight unit assembly, which is typical of a cca 1948/9 Oldsmobile. Photo received from Julie Goucher (UK) asking if we would be able to help identify the model details of this BSA. It was purchased by her father in law in Dorset, while stationed at Blandford Camp in 1958. He paid the sum of £250 for it but can not remember any more details. We can advise that LPR 937 is a Dorset County Council registration number which was issued between March and May 1958. 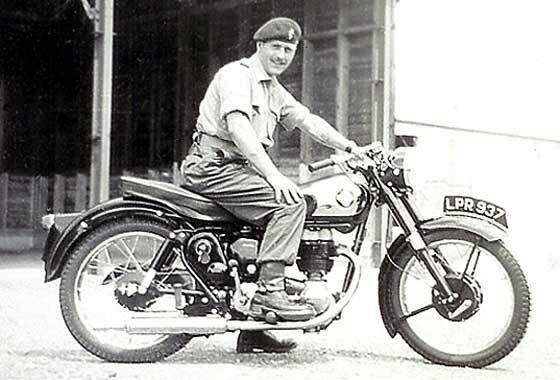 We therefore think the motorcycle in the picture is a 1958 BSA C12 250cc, see link to brochure.